Backup files for the current document. The Info screen appears. You may not see as many old versions listed. The number of items depends on how long you’ve been working on the document and how frequently you save. If you close the document, the list is wiped clean. Click to select one of the older versions of the current document. The older version opens in a new window; it doesn’t replace the current document. The document is shown in Read Mode view. The Ribbon is unavailable. The document title says [Read Only]. Click the Compare button to compare items from the saved document to the current document, or click the Restore button to restore that older version so that you can work with it further. 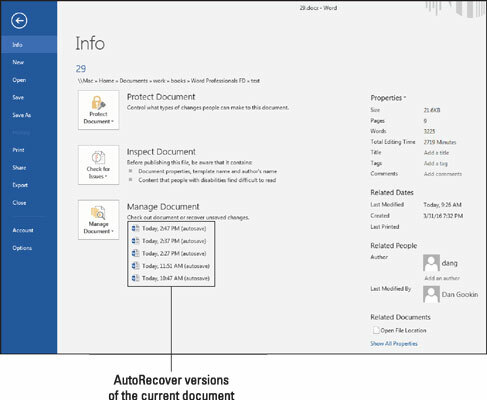 When you choose to compare the documents, the Revisions tab appears and the recovered document and original document appear side by side. You can scroll the windows to peruse the individual changes. If you choose to restore the document, the older version overwrites the current version. This may not be what you want, so use this option with caution. You can choose whether to save it. The old document can always be opened and reviewed again. These older versions vanish after you’ve closed a document. Only when you leave a document open for a long time and you frequently save the document are the older versions available.